The Sirloin vs Ribeye battle is complicated. There are great things about both of these steaks and which one is right for you depends upon what kind of mood you are in and how much you want to spend. Let’s take a look at these two steaks and find which one suits your needs. Once you see the location of these steaks on a steer then the differences between them are readily understandable. The ribeye comes from the middle rib section of a steer. The ribs don’t do much work when a steer is walking around so they tend to be tender and fatty. 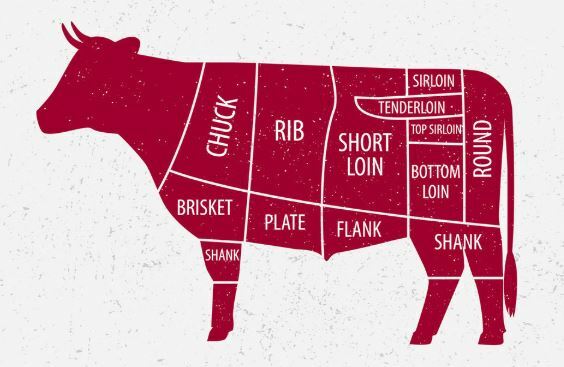 The sirloin comes from a section of the steer much closer to the legs. Since these muscles perform more work they are leaner and tougher. 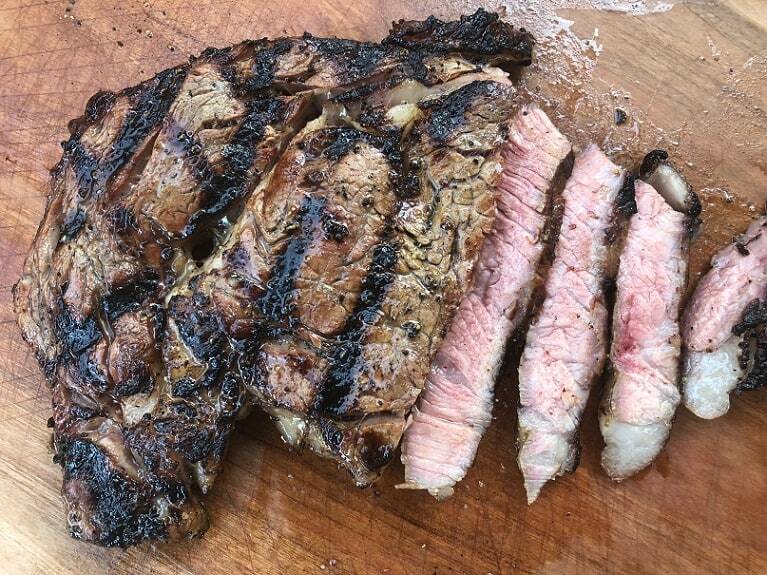 A common phrase is “fat is flavor” and, since the ribeye has more internal fat marbling than a sirloin, the ribeye is usually considered to be the more flavorful steak. The tenderness and marbling on a ribeye lends itself to being marketed as a premium steak. As such, ribeye steaks almost always cost more than a sirloin. At my grocery stores the choice grade Angus steaks a ribeye is $10 per pound compared to $6 per pound for the sirloin. 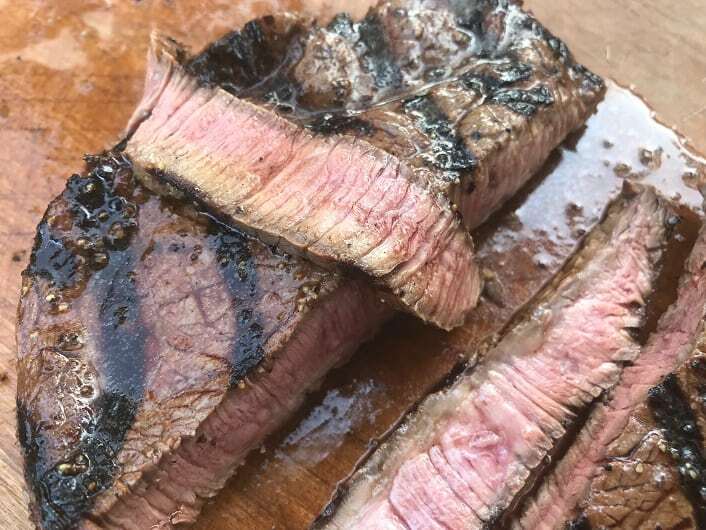 Here is another steak hack…a sirloin is always going to be lean. 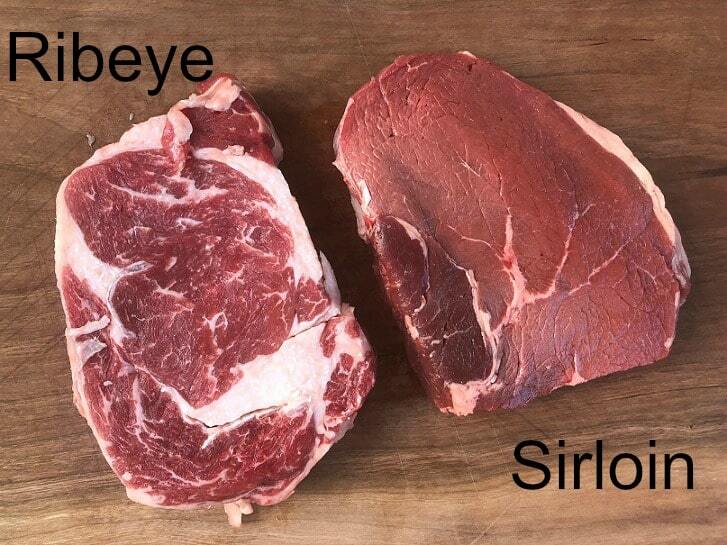 This means that there is almost no difference between Select, Choice and Prime grade sirloins. If you want to really save some money go ahead and buy Select. I would NOT recommend going for Select on a Ribeye because there will be a massive difference in the marbling. If you are trying to lower your grocery bill or want to feed a crowd on a budget then sirloin is the better bet. If you are on a date and want to splurge then the extra money for the ribeye will be well spent. Below is the nutritional content for a 3 oz serving of each steak that has been trimmed of excess fat. You can see that sirloin has fewer calories and saturated fat while delivering more protein than ribeye. This isn’t too surprising given the visible difference in fat content between these two steaks. If you are looking for lean protein then the sirloin is the better steak. Both of these steaks are perfect for grilling. When you grill these steaks side by side you will notice some differences. The higher fat content on the ribeye makes it a little more challenging to grill. As the fat on a ribeye melts and drips toward the fire it can easily create flare-ups and burn the meat. Even though some of the fat from the ribeye melts you will still have plenty of fat left in the finished steak. You can see that many of the slices will have a fat section on the tips and that there is still a large fat pocket in the center of the steak. By comparison, the sliced sirloin is much leaner but still incredibly juicy. Some folks love the extra fat on a ribeye while some folks refuse to eat it. And hey…I grill these just because I love to grill. These steaks are equally fantastic pan seared, cooked under a broiler or even sous vide. The ribeye is constructed of two muscles, typically called the ribeye “heart” and the spinalis, separated by a large fat deposit. Given the odd shape and premium price of a ribeye it really should be cooked as a steak and featured as the primary star of the show. The sirloin is a much more uniform cut of beef and, given its attractive price, can also be used for more creative applications. Sirloin is perfect for cutting into cubes, marinading and grilling on skewers as kabobs. Want to do a Beef and Broccoli stir fry? Go with sirloin. Want to make some fajitas but can’t find a skirt steak? Sirloin is an excellent substitute. There really isn’t a clear cut better steak between these two choices. The ribeye is more tender, flavorful and expensive. The sirloin is healthier, more versatile and affordable. Both steaks are freaking delicious so don’t stress over the choice too much!